Shanghai is a city approaching 20 million people, and it is arguably the most economically dynamic city in Asia. This concentration of population and economic activity surely has important long-term consequences. 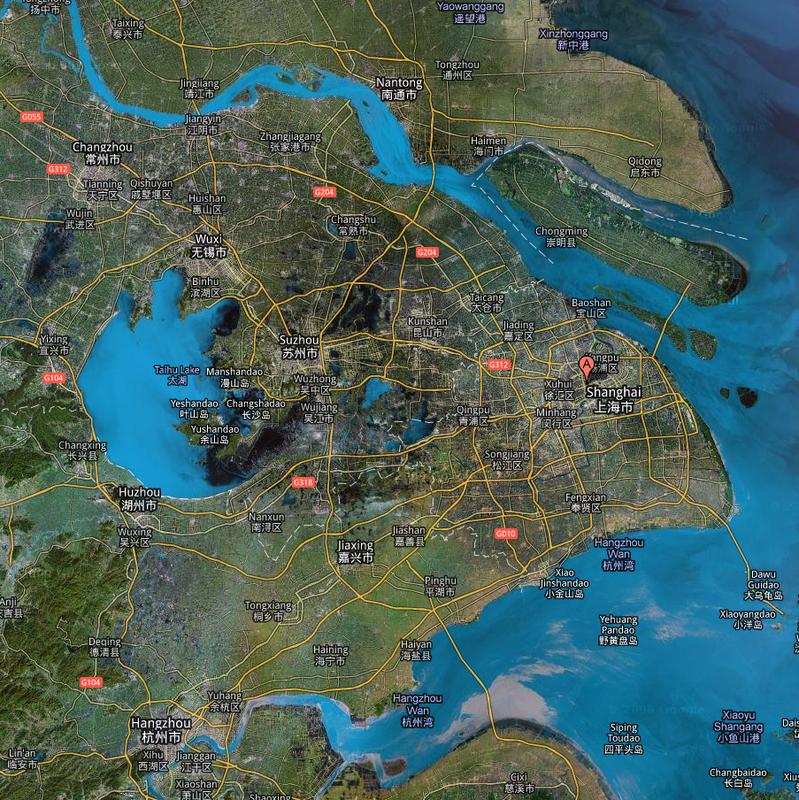 There was an interesting piece in the Shanghai Daily recently by Nate Stein, called “Sky’s the limit for well planned city of Shanghai.” Stein makes a really intriguing point about the Shanghai metropolitan region that seems very important. 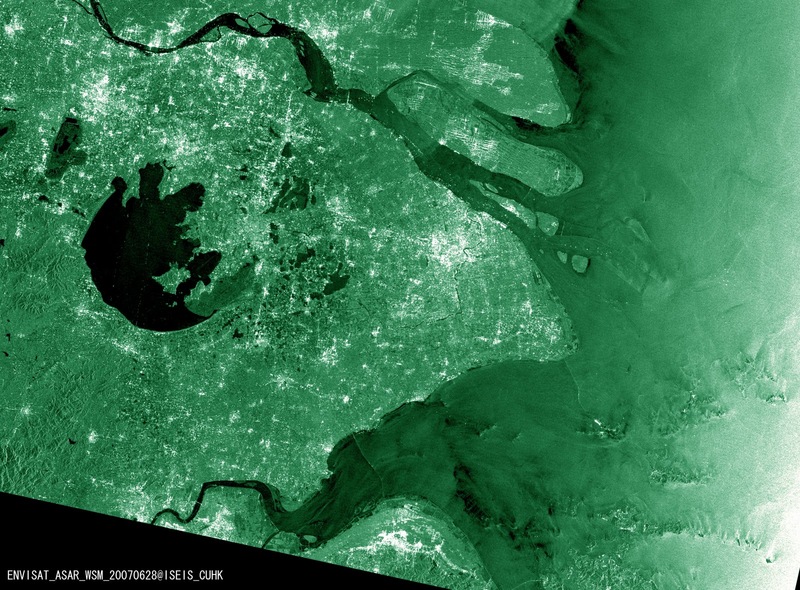 He argues that the “invisible boundary” of a city is a margin that is roughly 45 minutes from the city center; and that this boundary is moving out fast in the lower Yangtze River Delta. Improvements in transportation have brought a handful of mid-sized cities into the 45-minute zone, with the result that Shanghai is fast becoming the most populous high-density metropolitan area in the world. After building a subway in 1995 that has quickly grown to the world’s longest and most traversed, Shanghai’s invisible border moved outward significantly and drastically increased its growth potential. Instead of surrounding dense urban development with sprawling suburban homes, Shanghai’s residents live in apartment buildings that do not restrict the growth of a city like stand-alone homes do. Being built upon a backbone of compact flats and public transit, rather than homes on large lots and personal automobiles, means that the population has no upper boundary or, in a very literal sense, the sky is the limit, depending on how many people can fit in one building. People are stacked on top of and below others as growth extends up, and not out. Concentrations of people make mass transit feasible and waste less fuel and energy. Efficiency greatly increases in compact cities and provide for the feasibility of small businesses staying in demand among residents without cars who need the convenience of small neighborhood shops. The almost entirely urban design of Shanghai provides for impressively sustainable growth potential. The problem of overcrowding is on the horizon, but Shanghai has been effectively advancing its transit infrastructure. There is a two-level road tunnel under the Bund, the main portion of downtown, to prevent congestion and high-speed rail lines coming into existence that will further extend the reach of its invisible 45-minute boundary. 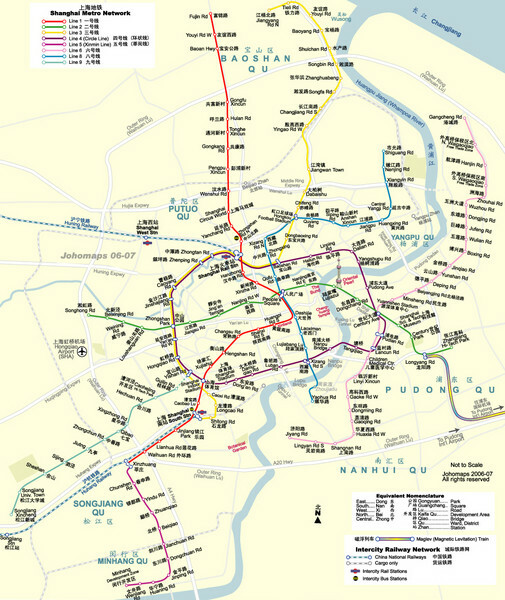 So Shanghai is a city with almost limitless density, in the sense that it can add population vertically rather than laterally and it can serve that population with a high-capacity rapid transit system. The system currently consists of twelve lines, with new track being added rapidly. It handles something like five million passengers a day. The other major improvement in transportation is the extension of the high-speed inter-city rail network. High-speed trains now connect Shanghai to Hangzhou and Suzhou, bringing those cities comfortably within the 45-minute radius of Shanghai. The high-speed train from Shanghai to Hangzhou takes only 25 minutes today. In practical terms, this means that there can be a tight integration among firms, knowledge workers, and universities throughout this region with a total population approaching 90 million people in the Yangtze River Delta Region. Professionals can live in Hangzhou or Souzhou and do their work in Shanghai. Here is the intriguing question: does this development of a high-density, high-population metropolitan Shanghai have important implications for social and economic development? Is this mega-city going to represent a qualitative change in the world’s urban history? Will Shanghai become a unique new kind of mega-urban place, with significantly higher growth potential than other world cities? One reason for thinking that this may be true is the case that people like Richard Florida and Saskia Sassen have made for the synergies created by a densely interconnected urban area. Florida talks about the concentration of talent afforded by a high-density city, and Sassen focuses on the economic and informational networks that are stimulated by high-density cities. In each case there is the idea of non-linear interaction effects and positive feedback loops. Sassen’s concept of a global city captures her core idea; a global city is one that has a large volume of connections to other cities around the globe, in terms of trade, services, telephone calls, internet traffic, and financial transactions (The Global City: New York, London, Tokyo. ). Shanghai is not the only large metropolitan area in the world, of course; but it appears to have features of urban system interconnectedness that take it out of the category of “sprawl” cities like Mexico City or Johannesburg. I have been asked to examine whether there are particular advantages to economic interactions at the megaregional scale and whether such interactions might play a role in enhancing the advantages of megaregions in today’s global economy. Familiar advantages of scales larger than that of the city, such as metropolitan and regional scales, are the benefits of sharing transport infrastructures for people and goods, enabling robust housing markets, and, possibly, supporting the development of office, science, and technology parks. Critical policy options identified by RPA in this regard would aim at strengthening the megaregional scale of economic interactions by investing in intercity and high speed regional rail, enhanced goods movement systems, and land use planning decisions. More complex and elusive is whether the benefits of megaregional economic interaction can go beyond these familiar scale economies and, further, whether this would strengthen the position of such megaregions in the global economy. One central argument I develop in this paper is that the specific advantages of the megaregional scale consist of and arise from the co-existence within one regional space of multiple types of agglomeration economies. These types of agglomeration economies today are distributed accross diverse economic spaces and geographic scales: central business districts, office parks, science parks, the transportation and housing efficiencies derived from large (but not too large) commuter belts, low-cost manufacturing districts (today often offshore), tourism destinations, specialized branches of agriculture, such as horticulture or organically grown food, and the complex kinds evident in global cities. Each of these spaces evinces distinct agglomeration economies and empirically at least, is found in diverse types of geographic settings –from urban to rural, from local to global. The thesis is that a megaregion is sufficiently large and diverse so as to accommodate a far broader range of types of agglomeration economies and geographic settings than it typically does today. This would take the advantages of megaregional location beyond the notion of urbanization economies. A megaregion can then be seen as a scale that can benefit from the fact that our complex economies need diverse types of agglomeration economies and geographic settings, from extremely high agglomeration economies evinced by the specialized advanced corporate services to the fairly modest economies evinced by suburban office parks and regional labor-intensive low-wage manufacturing. It can incorporate this diversity into a single economic megazone. Indeed, in principle, it could create conditions for the return of particular (not all) activities now outsourced to other regions or to foreign locations. It would appear from a non-specialist’s perspective, that Shanghai promises to have many of these multiple “agglomeration economy” dimensions, and from this we might expect that its economic growth will be accelerated with further densification. Does Shanghai rate highly enough in these three areas to qualify as a global city? Ye concludes that the data support a “yes” in each area. The Shanghai region represents a very significant percentage of the total Chinese GDP, and was increasing from 1992 to 2001 (7). It represented 5.16% of total GDP in 2001, with only roughly 1.5% of population. Second, Shanghai represented a significant concentration of China’s foreign direct investment and exports during these years. Shipping and air traffic were concentrated in the metropolitan region as well. So Ye concludes that “Shanghai has become a strategic concentration node for global capital” (12). Finally, Sassen’s most important criterion has to do with being a key node in the global network of professional services. He finds that here too, Shanghai measures up. So-called “tertiary” industries amount to 45.8% of employment — dramatically greater than China’s overall 27.7% rate (14). And the volume of financial services, insurance, and real estate (FIRE) business activity is very high as well. “Shanghai is leading the way to transform to an information-based professional service concentration place” (15). One important measure is the Globalization and World Cities Study Group assessment (link). GaWC singles out a list of 46 global firms (accounting, financial services, architecture, …), and then ranks cities according to how many offices they possess of these firms. Ye notes that GaWC identified 55 global cities based on the concentration of global advanced producer service firms in each city, and Shanghai is on this list, with 27 offices out of the 46 global firms (compared to 105 offices in New York). Ye concludes that Shanghai has “quickly adjusted from a traditional manufacturing center to a place that provides advanced professional services to the whole world” (17). It isn’t yet in the top rank; but it is increasing its global interconnectedness rapidly. These transitions from primary sector to tertiary sector businesses that Ye documents indicate that Shanghai is already well on its way to being a knowledge-centered global city. And the processes of densification described above should only amplify this process.